Hello! My name is Scott and I have been your blog host since 2005! I started collecting coins at 10 years old searching through my father’s pocket change filling those ubiquitous blue folders. A few years later, I started to deliver Newsday in Inwood, Long Island where I continued to plug those folder holes with the change received from delivering newspapers. Through my teen years, which included a move to Charlotte, I amassed a modest collection mainly from pocket change. One of my early passions were the United States bicentennial coins. Like many young numismatists, my collecting pursuits waned when I entered college. After college, life took over. Even though my folders and my complete album of Roosevelt dimes traveled with me, I would only show a passing interest in them while navigating through my career and everything else that went along with young adulthood. Following the untimely death of my first wife, I was looking for something to occupy my time and found the coin albums and folders on my shelf. Slowly I started collecting again but this time taking the time to learn more about what I am collecting. Once again, I became hooked on numismatics. That began my latest journey that started with joining the Montgomery County Coin Club. Finding a club with an active membership, I embraced the challenge to become more active and looked to make an immediate impact. 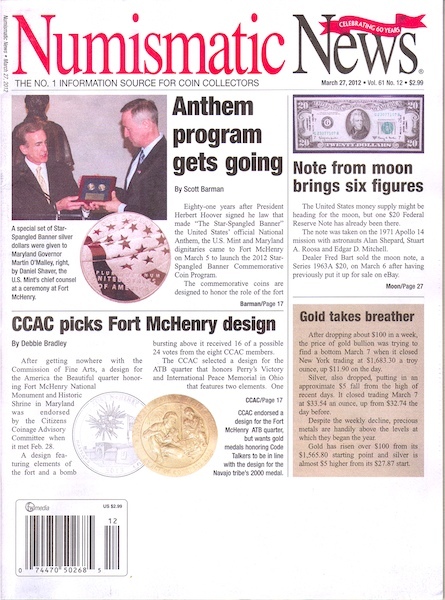 Shortly after joining, I became Webmaster of the MCCC website (montgomerycoinclub.org) and began to contribute to meetings with presentations. Eventually, I was elected to the MCCC Board of Directors before being first elected club president in 2008. → A blog post about the profile that can be read here. Contributor to the Official Blackbook series of price guides. Authored the chapter “How to Use Technology to Enhance You Collecting experience” that was tailored for each of the Blackbook topics.